Hellboy might be my ideal comic book. Pulling inspiration from the works of Lovecraft, Jack Kirby, and folk tales and mythology from around the globe, it covers the bases of Things Will Standish Likes in ways that media rarely does. I mean, I have room in heart for a lot of comic characters, but very few of them have ever shot Baba Yaga in the face. 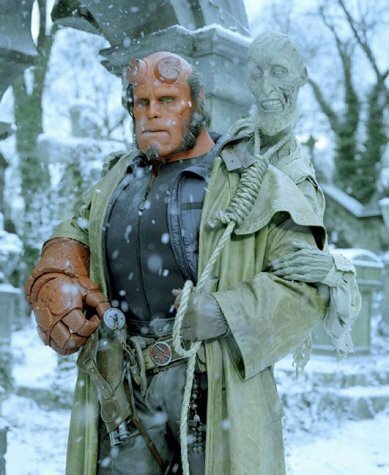 So in the spirit of Octoberween– and of last week’s release of Crimson Peak— it only made sense to take a dive into Guillermo Del Toro’s fun, if occasionally misstepping 2004 adaptation of Hellboy. The plot: In the waning days of World War II, allied forces interfere with a Nazi plot to summon a Lovecraftian Old God led by Grigori Rasputin (Karel Roden). The interrupted ceremony succeeds only in summoning a baby demon, named Hellboy by the allied forces and promptly adopted by their paranormal advisor Professor Revor Bruttenholm (John Hurt). Sixty years later, Rasputin and once again begins setting his plan in motion. Hellboy (Ron Perlman), now an investigator for the government’s Bureau of Paranormal Research and Defense (BPRD) must prevent the apocalypse with the aid of fish-man Abe Sapien (Doug Jones, voiced by David Hyde-Pierce), pyrotkinetic Liz Sherman (Selma Blair), and Pretty Regular Guy John Myers (Rupert Evans); a plot in which Hellboy is more integral than he realizes. What’s refreshing about del Toro’s adaptation is that it is just that. Del Toro keeps true to the vibe and the distinct visual style of Hellboy creator Mike Mignola’s work, while still making a film that feels distinctly del Toro’s own. It helps that Del Toro and Mignola’s visual style are well-suited for one another, as the director clearly relishes in the deep shadows and rich, eery settings of Mignola’s drawings. Drawing from Hellboy stories “Seed of Destruction”, “Seed of Evil”, “The Corpse”, and others, the movie synthesizes some of the most alluring bits of the Hellboy mythos into 122 minutes, while leaving enough room for del Toro to do his own thing with Mignola’s characters. Guillermo Del Toro grounds the supernatural adventure in the family of outsiders that constitute BPRD. Del Toro’s script fleshes out the central characters and their relationships from what’s on the page, putting a particular focus on Hellboy’s relationships with Bruttenholm and Liz Sherman. Del Toro expands the scant details about Bruttenholm in the comics to create an affecting father/son dynamic that’s aided by the fragility with which he’s played by John Hurt. It probably goes without saying that Ron Perlman is great in the role, right? It’s one thing to be able to deliver lines with the matter-of-fact delivery of the comics, but quite another to perfectly capture the character’s melancholy sense of otherness, and Perlman does both beautifully. Del Toro recognizes the kindred spirits of Hellboy and Selma Blair’s deadpan Liz Sherman, and really sells their complex and halting romance as one that humanizes on party while making the other feel more alien. Unfortunately, killer design and character work don’t quite save Hellboy from the sins of comic book cinema. There’s a lot of world building going on in Hellboy and the first half of the film stalls for it. Unable to work with the same level of cultural familiarity enjoyed by the Supermen and Spider-Men of the world, the film has to do a lot of heavy lifting with its exposition. Mignola’s greatest skill (after drawing, character design, and world building, etc.) is the way he’s able to introduce mythology without disrupting the propulsive nature of the story. The film adaptation never quite manages the same, with asides and speeches that slow the story down. Hurting matters more than they help is the introduction of FBI agent John Myers as audience surrogate. While introducing a character from outside the world of the film is useful for introducing the rules of the world to the audience, Myers suffers for being the least interesting character in a room filled with fascinating ones. Myers is defined by his normalcy, proving to be a romantic rival to Hellboy for Liz Sherman’s affections because of the normal world he represents; it’s a concept that could be interesting in a world as insular as Hellboy’s, but instead each scene focusing on him feels like a break from the weird and wonderful world around him. 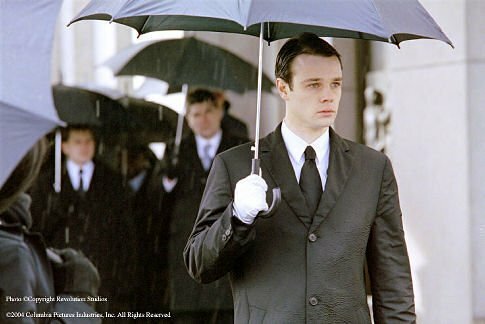 It doesn’t aid matters that Myers actor Rupert Evans suffers from what Twin Peaks fans will recognize as terminal James Hurley face. The action in Hellboy also feels a little too of its time. Hellboy’s battle with a hellhound (portrayed by a dude in a costume!) capture the drag down brawls of the comics, too frequently they have the residual ramping effects of post-Matrix action movies and beats that worked better in Raimi’s Spider-Man and equally not that well in Daredevil. Hellboy, despite its flaws, is the rare case of the right director being attached to the right property. Hellboy is a well-executed adaptation of a comic that still manages to feel like a director’s personal vision. 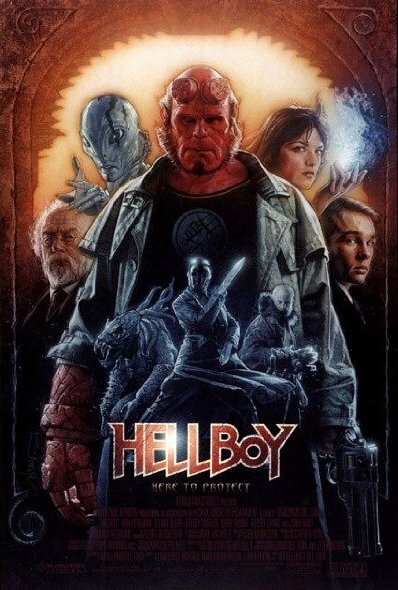 While Hellboy is a series that still comes to life most effectively on the page, the 2004 movie is an early example of how to adapt the heart, if not necessarily the page of a comic. -I know some product placement is a given in big budget comic book movies, but making an obsession with Baby Ruth bars a part of Hellboy’s character seems particularly puzzling. -Give me one good reason why BPRD should be based in Newark, New Jersey instead of Fairfield, CT like the comics. Oh, right. NYC. ← Second Breakfast: ‘The Martian’… Yeah!